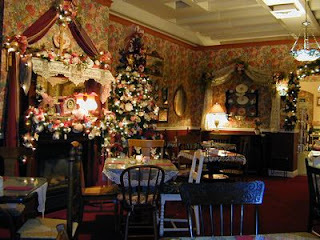 Miss Molly's Tea Room and Gift Shop in Medina, Ohio is a quaint place for mothers and daughters and favorite dollies. It's for Red Hatters and a day out with the girls. It's for going alone and observing. If you have a truly romantic husband, it's for couples. Sometimes you'll get a great waitress like Michelle, other times you're waitress will be more of a character than a waitress. They're always nice, and the food is always interesting and good, so you can't go wrong. The lovely attached gift shop is worth the trip all by itself. As a matter of fact, I know many people who have shopped in the gift shop many times, but never had lunch at Miss Molly's. Lunch at Miss Molly's is a treat. I'm not sure how many varieties of loose tea they have, but the list is a full front and back of a menu long, so my guess is somewhere around 50 varieties of loose tea, along with a few varieties of tea bags, gourmet coffees and cocoas, iced tea, lemonade, and the typical soft drink fare. Miss Molly's will even open up special just for your group of 25 or more. Children's parties are Saturday mornings or Friday evenings. Reservations are recommended, but not required. Laduree, Otherwise known as Laa-Dee-Daa! So You Think You've Had Good Chocolate Mousse? Pink Elephants? No. Blue Elephants? Yes!